Great DIY metallic pocket invitation designs start here! 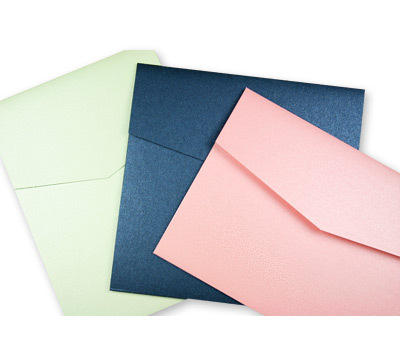 Offered in rectangular and square sizes, four styles, three brands, and a rainbow of colors, you won't feel restricted by our stunning collection of metallic invitation pockets. Pockets are made with premium, thick, heavyweight metallic card stock that is finished on both sides with a striking iridescent, mica-infused coating. Pockets come in packs of 25 and are fully assembled and pre-scored for a crisp fold every time. Fill pockets with pre-cut metallic blank cards and mail in a complementary metallic envelope to create something truly unique for your big event. When you have more than just a single invitation card to send, simplify and organize with DIY-pocketfolds. Consider a them an inner envelope with a pocket that allows you to stylishly compile your invitation card, additional insert cards, and response items. It's a neat look, quite literally. Choose from over 20 glimmering metallic colors produced by Stardream and Aspire Petallics. Whatever the occasion, your invite will set the perfect tone and shine with style. 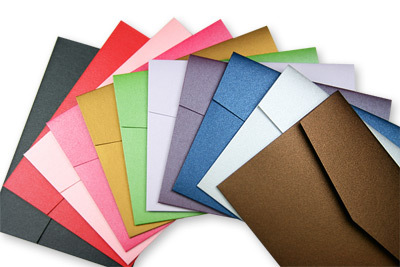 Apparent to both the eye and touch, metallic DIY-pocketfolds are rich in color, finish, and quality. You'll love their beauty at first sight (and so will your guests)! Choose from three sizes, 5" x 7", 6 1/4" x 6 1/4" and 5 1/8" x 7" to cover most invitation needs. Create a consistent design with matching papers and envelopes. We have an incredible array of colors, textures and finishes for you to choose from, so mix, match, and create the perfect invitation for your big event!